In the Red Sox We Trust? The Sox will probably break your heart, but there are still plenty of reasons to believe. By Tony Massarotti·	 3/5/2017, 6:30 a.m.
For the past 15 years, you’ve known the face of the Red Sox as if it were your own: the furrowed brow of a pensive Theo Epstein; the bespectacled baldness of a self-deprecating Terry Francona; the infectious, illuminating smile of a jubilant David Ortiz, all fused into an organization that brought you unprecedented success, stunning failure, joy, anger, frustration, and fulfillment. “If we have success,” he quickly added. For a century, the one thing you could count on—with three clearly notable exceptions—was that the Red Sox would break your heart if you let them. So given all the new faces and the unfamiliarity with this year’s organization, it makes sense to ask yourself a simple question: Should I trust these Red Sox? If you’re anything like me, the answer will sound a lot like, Yeah…but. 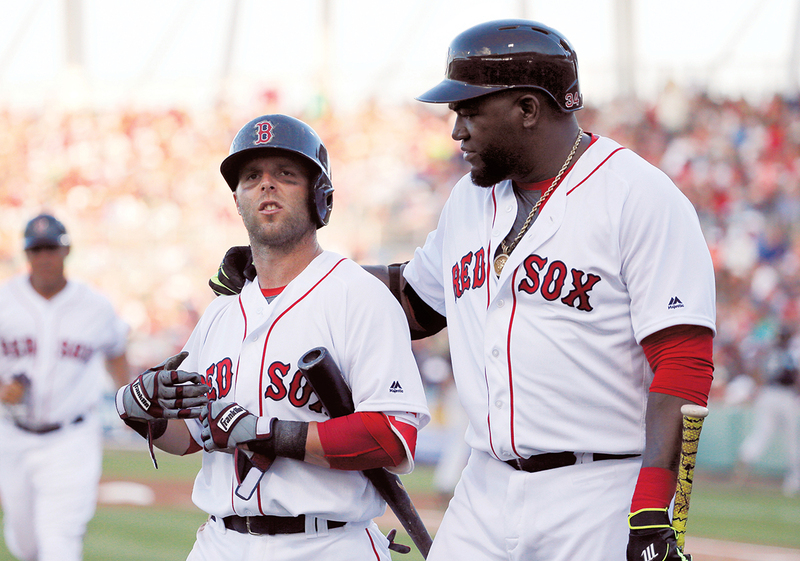 But Pedroia has been around long enough to know that’s not always the case. Sure, there were the championships, but the Red Sox suffered a stunning collapse in 2011, and finished last in 2012, 2014, and 2015 before making the playoffs again in 2016. Pedroia also jousted with egomaniacal manager Bobby Valentine in 2012, played great in 2013 and 2016, and got hurt and was sidelined for much of 2015. As much as anyone, he has seen the many sides of the Red Sox—the bad and the good—and all that comes with playing in a market where the relationship between the team and fans can sometimes feel like a marriage. He has seen the team win, then get torn down and reconstructed. Now, Pedroia knows, it’s his turn to be the clubhouse leader, so he’s taking on the role of patient teacher and motivator—keeping expectations high yet in check. “Recently,” he tells me, “we kind of [played Bogaerts, Betts, and Bradley] and a lot of young guys at the same time. That’s kind of asking a lot for those guys to go to a World Series and an American League Championship right out of the gate.” It took a while for the 2007 World Series team to come together, and today’s group, as Pedroia says, will also need “a long time to develop.” And while that might not sound encouraging or seem like much of a reason to trust the Sox this coming season, it helps knowing a familiar face and proven winner is still leading the team on the field. While most every fan knows deep down that the Sox’s 2013 World Series win was a fluke pulled off by a team of misfits, there’s reason to believe they can do it again. The current roster is young, dynamic, and should remain together for at least three years, so long as the club can hold onto its core. Heading into the season, Kennedy also sees “a renewal of optimism,” which is no small thing. Compared with just three seasons ago, ticket sales are up and the organization is teeming with new personnel and talent. Still, you’d be wise to question them, individually and collectively. I know I do. The 60-year-old Dombrowski, for instance, while accomplished in his nearly 30 years as a general manager and team builder, has won just a single World Series, with the Florida Marlins in 1997. He’s notorious as someone who will mortgage the long-term future of a ball club for instant success—a reputation bolstered by the off-season blockbuster trade that brought Sale to the Sox. (Last year, based on several assessments of all 30 major league player development operations, Dombrowski traded away five of the team’s top 10 prospects.) Before coming to Boston, he did essentially the same thing in Detroit, where the Tigers flirted with a championship but ultimately failed. Today, as a result, the Tigers have one of the worst minor league systems in professional baseball. The 2017 Red Sox claim they are ready to buy in, and so am I. Are you?